MW to more than 19 MW, and is suit- able for a variety of vessels designed for high speed and good maneuverability operation. The standard drive of the fixed-pitch propeller includes air-cooled six-phase synchronous motor. Lips for Seven Seas Voyager also includes a complete propulsion system with synchro-converters, control and joystick system, diesel alternators and a high-voltage distribution assembly with propulsion and main transformers as well as bowthrusters. Hellenic Shipyards Co. The submarines will be powered by Siemens Permasyn electric motors - permanently synchro- nous machines suitable for a DC power supply that are very low signatures, compact and easy to operate. PEM fuel cells as AIP systems (air independent propulsion), will power the submarines when submerged. The AIP system is produced by HDW with Siemens pro- viding the fuel cell modules and the supervisory systems. Send and receive private voice, lax and e-mail with your VHF radiotelephone over the MariTEL Network. MariTEL provides 50 to 1D0 mile coverage versus as little as 5 miles with a cellphone. 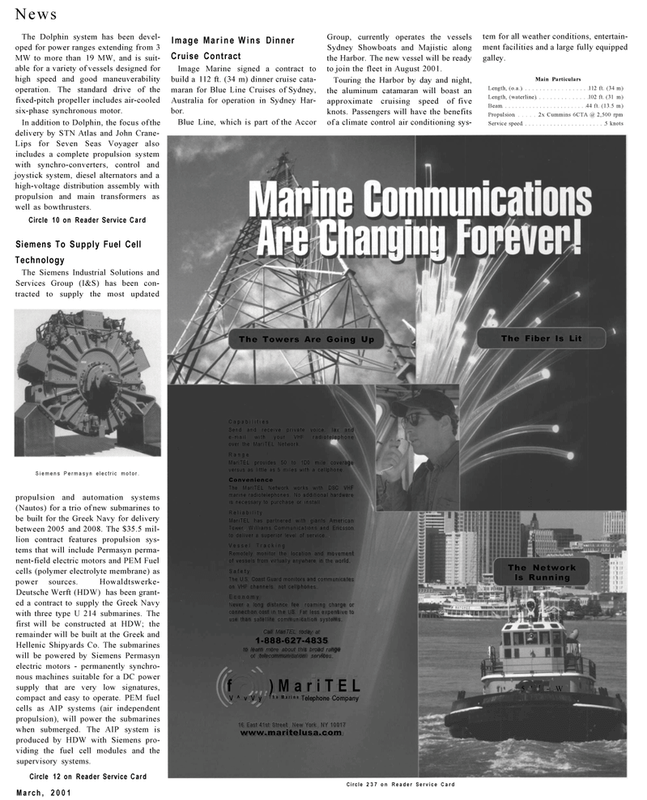 The MariTEL Network works with DSC VHF marine radiotelephones. No additional hardware is necessary to purchase or install. Tower. Williams Communications and Ericsson to deliver a superior level of service. Remotely monitor the location and movement of vessels from virtually anywhere in the world. The U.S. Coast Guard monitors and communicates on VHF channels, not cellphones. Never a long distance fee. roaming charge or connection cost in the US. Far less expensive to use than satellite communication systems. Call MariTEL today at 1-888-627-4835 to learn more about this broad range ot telecommunication services. Australia for operation in Sydney Har- bor. Sydney Showboats and Majistic along the Harbor. The new vessel will be ready to join the fleet in August 2001. Touring the Harbor by day and night, the aluminum catamaran will boast an approximate cruising speed of five knots. Passengers will have the benefits of a climate control air conditioning sys- tem for all weather conditions, entertain- ment facilities and a large fully equipped galley.